Our main campus is located on Treaty 6 Territory and the Homeland of the Métis, and we pay our respects to the First Nations and Métis ancestors of this place and reaffirm our relationship with one another. 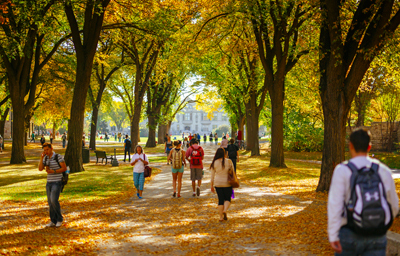 Our historic main campus in Saskatoon is recognized as one of the most beautiful in Canada, with plenty of green space, stately greystone buildings and tree-lined walkways. As you explore this place, you will discover the spaces that define your university experience. Museums and galleries, libraries, sporting event venues, student hangouts and natural spaces are where life happens and where your most powerful memories can be created. There is more to campus life than class and studying. We have a lot of opportunities to meet new people and have fun. With over 130 campus clubs and societies it's easy to find a group of people with common interests. Joining a group is extremely easy and is a great way to meet like-minded people. Join as an individual or as a team one of our many intramural sports leagues that range from inner-tube water polo to soccer and more. We have one of the largest and most active intramural sports programs in the country; we have more than 50 intramural hockey teams alone! You will also have access to tennis courts, a curling rink, a hockey rink, numerous fields (football, soccer, baseball) and an outdoor track, all included in your student fees. Whether it is a Friday night lights football game, our championship-winning basketball team or one of our many other Huskie athletic teams, catch a home game on campus and share the pride! Free for students. Located on campus, Louis Pub hosts both touring and local bands shows throughout the year. We also have numerous ensembles open to all uSask students including including concert band, jazz ensemble, music theatre and chorus, just to name a few. Our Department of Drama puts on four plays a year through its Greystone Theatre, showcasing the work of our students on and off stage. Or you can attend or audition to be part of a drama production with the St. Thomas More College theatre group, the Newman Players. Our ballroom dance club is one of the largest on campus with over 1,000 members. Campus Rec also has the swing dance club as well as learn-to social dance and learn-to belly dance classes. The Aboriginal Student Centre (ASC) is a gathering place to study, meet others, take part in social activities like soup and bannock or join in cultural programming like Elders Services, CreativiTea and Knowledge Keeper presentations. 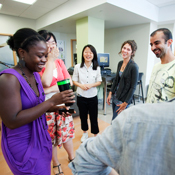 The International Student and Study Abroad Centre (ISSAC) is a place students can relax with friends, enjoy lunch, study or get involved in the campus community. 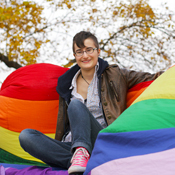 The USSU Pride Centre is a welcoming, vivacious and celebratory campus community. Join a friendly environment with a diverse group of people of all sexual orientations and gender identities. 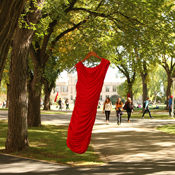 The USSU Women's Centre is a safe, dynamic, comfortable, positive space to organize around feminism and activism. There's a lounge to hang out in and meet like-minded people. 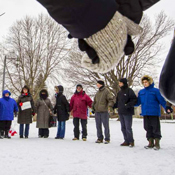 Through the individual chaplaincies, the chaplains offer regular worship on campus, prayer and meditation groups, discussion and social justice groups, retreats, and workshops. Our students enjoy a high level of support typical of a smaller university, creating an environment that inspires collaboration, innovation and discovery. 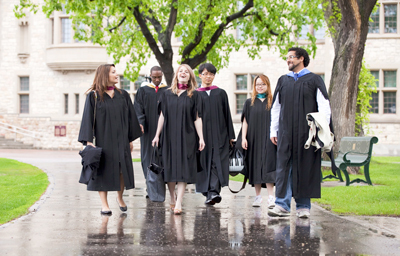 Established in 1907, the University of Saskatchewan has a long history of excellence. Our graduates are known for their work ethic, resourceful nature and determination, and will continue to build on our history of success to address the world's challenges now and in the future. 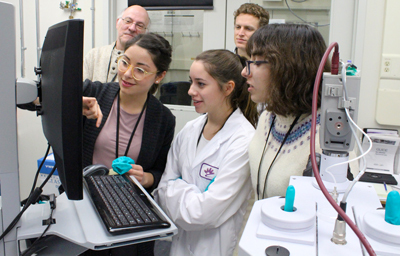 One in four uSask students will have a hands‑on research experience while working on their degree, and one in 10 will have that experience in first year. uSask is a place where you can learn, grow and be part of a community that recognizes how beautiful knowledge can be. Our students have the opportunity to gain practical, hands-on experience in their field of study, whether by taking part in an internship or co-op program, participating in a field class, or by taking advantage of a study abroad or exchange program at another Canadian or international institution. You will have the opportunity to contribute directly to the world’s knowledge as you work alongside renowned faculty in some of the most advanced research and education facilities in the world, such as the Canadian Light Source synchrotron, VIDO-Intervac (one of the world's most advanced containment level 3 vaccine research and teaching facilities) and the Global Institute for Water Security.